A country not for poor? Mahagun Moderne, a plush multi-towered gated community located in Noida, was attacked by a group of people who lived in a nearby slum. They alleged that their fellow slum dweller, who worked as a maidservant in one of the apartments of the housing society, was assaulted and held hostage by her employer. Many people may feel that this is only a case of a bunch of ‘low class’ hooligans attacking a posh residential complex resided by civilized elites. There is, however, more to it than that. Whether we accept it or not, this is a classic case of ‘class struggle’- a struggle between the wealthy that are neck deep in consumerist lifestyle and those that are stuck in abject poverty, and therefore, are deprived of even the basic necessities. In India, the spread of gated communities is increasing at a faster pace. They are the embodiments of the neoliberal spaces that are exclusively accessed by the upper-class elite. In a way, they are opposed to the idea of an open and democratic urban space shared and accessed by all. The Gated communities in India, as anywhere else in the world, are a reflection of the underlying tensions in the social fabric and symbolize a polarized class structure. The main motive behind preferring a gated community is to have a secure and comfortable life believing that the tall walls and the security guards manning the gates will make them immune from the societal problems and the associated safety concerns. In the case of Mahagun Moderne, however, neither the gates nor the security guards could make its residents feel fully secure and they appeared shaken to the core by what happened inside their edifice. This is a lesson to all the people who plan to build societies away from the larger society and thereby feel a false sense of security. The fact remains that, they, in spite of being elites, can’t escape being part of the larger society. Because they can’t do without venturing out from their gated communities and they can’t even do without employing the ‘low class’ people as their maidservants who are supposedly prone to crime, the very thing they wanted to escape. In a democratic society, violence, in any of its manifestations, is severely reprehensible. However, at the same time, the people in the citadels of power should also think about the root causes of these violent incidents and take remedial action. Otherwise, they keep reoccurring. In India there is a large unorganized sector, where laborers are exploited by their rich and powerful employers. They lead precarious lives and work under pathetic conditions. Maidservants, owing to their status of being poor women, are more vulnerable. They are often accused of theft and subjected to harassment. Whether the maid, in this case, had indeed indulged in theft and whether the employer had indeed physically assaulted her are still under probe. However, what happened after the incident is worth delving deep into. As per the news reports, within days of incident happening, the ghetto, from where the attackers emerged, was razed without any warning on the pretext of removing encroachments. Even the housing society had imposed a ban on many of the maidservants from entering the society thus depriving them of their livelihoods. 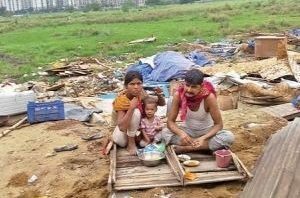 Moreover, a section of the people and politicians started accusing the slum dwellers as illegal Bangladeshis and started branding them as a threat to the law and order. Later on, it came to light that the people living in the shanties were Bengali speaking Muslims from Cooch Behar district of West Bengal and not from Bangladesh. In the aftermath of the incident the Union Culture Minister, Mahesh Sharma, visited the housing society and took an unashamedly biased stand giving a clean chit to the family that was accused of assaulting their maidservant in spite of the fact that the case is under investigation. He even used the occasion to severely castigate the human rights organizations, who raised their voice against the suppression of the slum dwellers on the pretext of law and order, and went on to state that his party workers will give the rights organizations a befitting reply. Instead of acknowledging the fact that there is an urgent need of improving the working conditions of the unorganized laborers and narrowing in on the culprits who are responsible for the violence, the government brandished its brute force and destroyed the livelihoods of the underprivileged. The politicians preferred to visit only the wealthy gated community and listen to their grievances but no one bothered to visit those whose shanties were razed. This is a phenomenon that is symptomatic of the neoliberal policies of the government where the spaces reserved for the wealthy elite, who lead king-sized lives, ever expand and the spaces for the poor keep on shrinking. Politicians, bureaucrats and the gated community dwellers may gloat at their repressive actions and feel triumphant temporarily but their behavior will only aggravate the societal problems. They should realize the fact that the incident is an indication of the deep-rooted frustrations and simmering discontent among the socially and economically disenfranchised people, and therefore, does not augur well for the society. The laissez faire economics, which resulted in an intensified concentration of economic power, has empowered the rich and the ultra-rich to turn this country into their fiefdom. The continuous shrinkage of space, opportunities and dignity for poor and underprivileged will push them to the wall and their misery will eventually stoke large scale social unrest. The so-called triumph of neoliberalism is neither final nor irrevocable and there is still plenty of room for developing an alternative economic system. The world has already experimented with two extremes – communism and capitalism – and both have made the lives of the people miserable. Therefore, the new system should be devoid of any extremes and should enable even the marginalized sections to lead a comfortable and dignified life. This entry was posted in Society and tagged mahagun moderne, neoliberal policies, poor on August 5, 2017 by Dr. Ramachandra Reddy.